Nothing beats zinnias for lasting color in your garden. They are the easiest annual plants to grow from seed which will come up within a week during warm weather. Zinnias are sturdy plants and come in a rainbow of colors and color combinations. A a wide variety of shapes and flower forms are available to suit any sunny space. For borders, there are the miniature types such as dwarf, lilliput and pompom types. These stay under a foot in height and are covered with little ball shaped flowers all summer long. On the other end of the scale, you can grow giant zinnias that stand several feet tall with blooms 5 to 6 inches across. These may need to be staked because the large bloom makes them top heavy, but they are worth the extra effort since they produce very long lasting cut flowers. Don't hesitate to cut the flowers - more will come to take their place. Zinnias like it hot - so select a sunny spot to plant your seeds. Don't plant too deep, just barely cover. A good way is to first wet the area lightly, rake the soil, then spread the seed and water in by spraying with the hose. Keep moist until seeds germinate. Thin to stand the recommended distance apart by pinching seedlings off at soil level. Tip: when plants show the first sign of a flower bud forming, pinch it off. I know - you don't want to do that because you are waiting for that first flower, but there will be another stem developing from each of the topmost leaf axils which will give you that many more flowers and also make the plant bushier. Growing zinnias can be a rewarding experience. 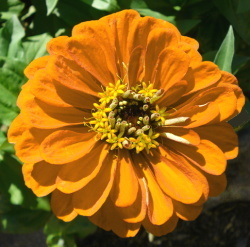 However, there are several problems associated with growing healthy zinnias. You will need to be prepared to spray for spider mites and powdery mildew. Don't wait to see IF you get them - you WILL. The easiest and most efficient way to combat these evils is with a hose-end sprayer that delivers the appropriate insecticide.